Difference between pressure mounted and hardware mounted baby gates? 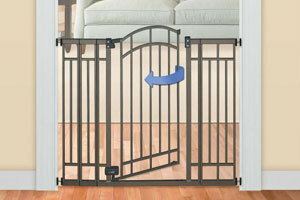 Baby safety gates come in many different design forms, from retractable to walk through to play yards. But unless the gate is freestanding there are just two ways to mount a baby gate: pressure mounted and hardware mounted (also called wall mounted). Pressure gates have spindles that press against the wall to hold the gate in place. 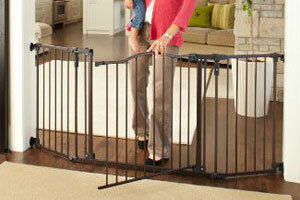 Pressure mounted baby gates are the most common type of gate, and often the cheapest too. On the top and bottom corners of the gate there are threaded spindles with a bumper on the end, much like a large screw. 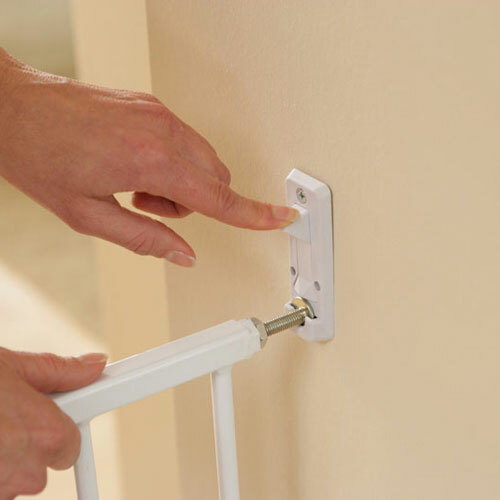 When putting up your gate, you will simply unscrew these spindles until they come out far enough to contact your wall. Then once the gate is held in place by the pressure of each spindle, turn them each a bit more to ensure you have a snug fit. Pressure mounted gates are preferable to some people because they do not require you to drill into a wall with screws, like a hardware mounted gate. However, that doesn’t mean that pressure mounted gates will not cause any damage to your walls. 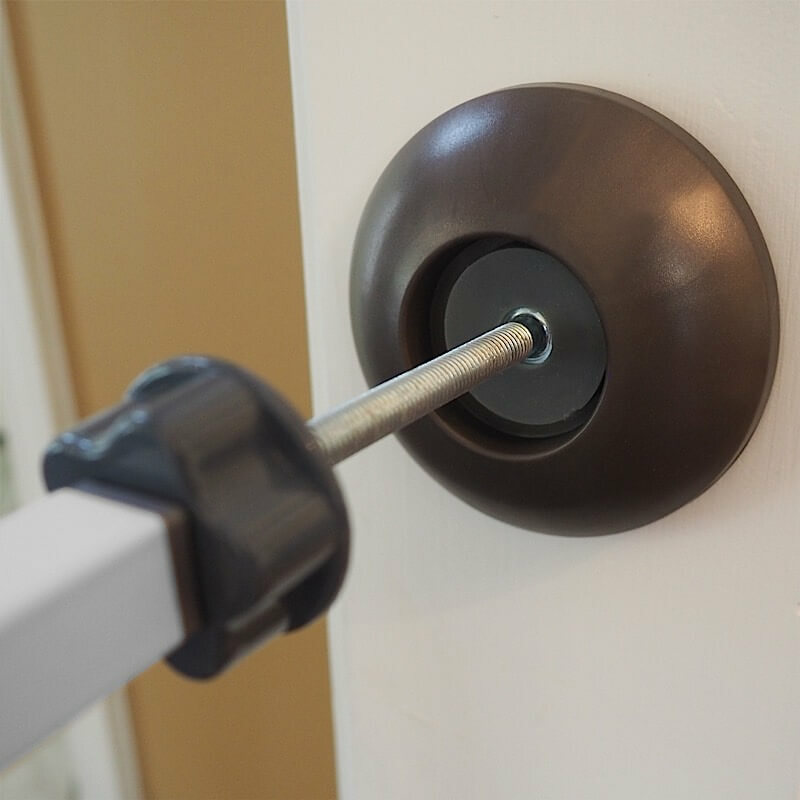 Depending on the spindle’s bumper and the bumps and force your gate is subjected to on a daily basis, pressure spindles can chip paint, cause indentations, and on rare occasions even put holes in your drywall if hit hard enough. 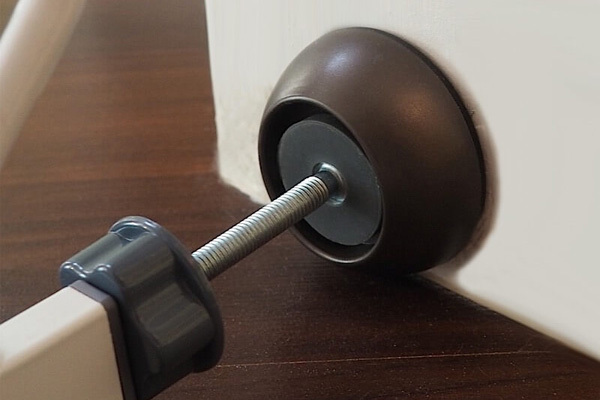 Using a pressure gate wall protector can save your walls from any damage caused by pressure spindles. Avoiding that damage is relatively easy though. You can purchase a pressure mounted wall protector set, like the one we sell, for often less than $15. These work by spreading the pressure your wall is subjected to over a larger surface area, which prevents any damage from happening. They also often create a tighter fit against the wall, since you can tighten them harder. 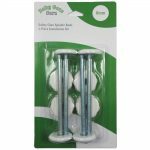 And because they stick out 5/8″ on each side, they let you fit an up to 1.25″ wider space, if you are otherwise just short of being able to fit a gate in. 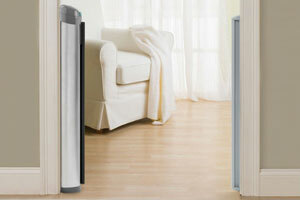 Pressure mounted gates work best in doorways, hallways, relatively small entryways and living rooms, and smaller spaces in general. 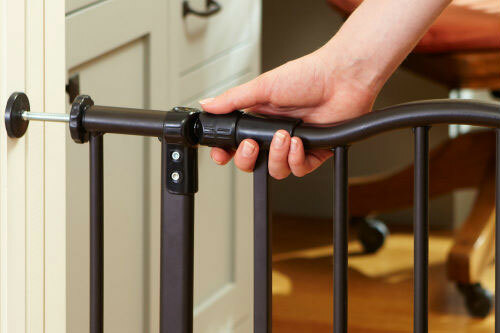 Extra wide baby gates will often use hardware mounts, because the wider a gate is, the less it is able to stand up securely with just pressure. 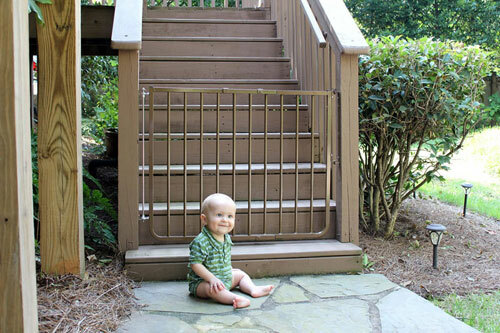 Pressure mounted gates are never for use at the top of stairs, as the risk of a leaning child or pet falling through them is always present. Instead of being held up by pressure, hardware mounted baby gates come with varying brackets that you screw into the wall, then connect the baby gate to, which is why they are also sometimes called wall mounted baby gates. This results in a sturdier connection and a baby gate that is not going to fall down. 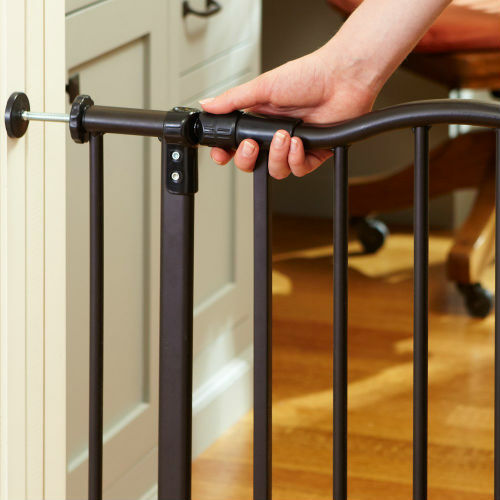 A hardware mounted baby gate requires screwing the hardware into your wall. 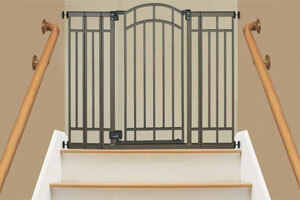 As a result, hardware mounted gates are the right choice for putting at the top of stairs. While necessary, any old hardware mounted gate may not be sufficient for use at the top of stairs. Besides just the mounting type, you want to look for safety gates that are certified for that specific use, such as JPMA certified gates. Hardware mounted gates are a great choice for people who are installing a safety gate as a more permanent feature. Pressure mounted gates can be easily moved around and stored, but if you have a long term need for a safety gate, such as being a pet owner, running a daycare, planning a big family, or using it outdoors, the extra security of a hardware mounted gate can certainly be worth it. 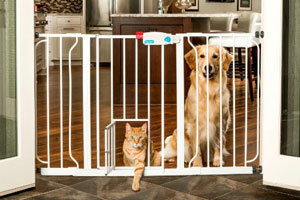 Hardware mounted gates are also a necessity for many super wide uses. The downside of hardware mounted gates, of course, is that they put holes in your walls when you screw them in. It is for this reason that pressure mounted gates are more popular overall, but there are many use cases where hardware mounted gates are worth the wall damage. Besides, if you ever decide to move or get rid of the wall, drywall holes are nothing that a little patch and paint can’t fix quickly. 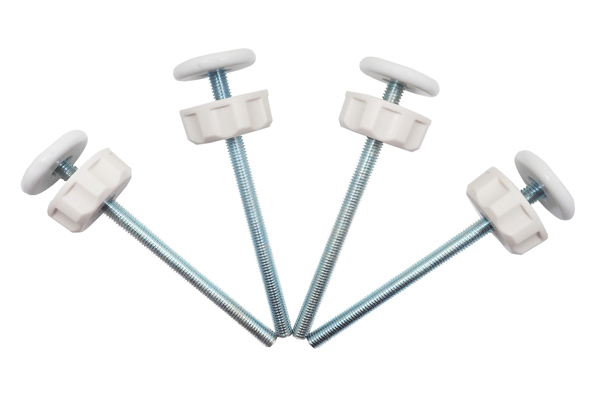 Generally when you are installing hardware mounted gates you want to screw the hardware into a stud or doorframe. This will give you the most stability in your gate. 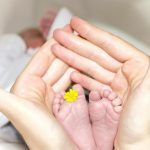 We hope this article has been helpful in explaining the difference between pressure mounted and hardware mounted baby gates. Let us know in the comments if you have any questions.